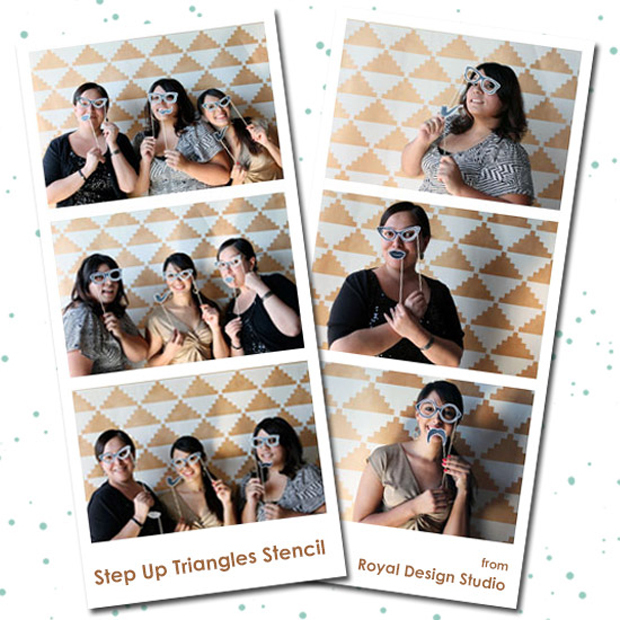 For a fun, festive, and inexpensive way to get wedding guests buzzing is to create a custom photo booth backdrop with any of our stencils. This beautiful bride favors clean, bold, geometric patterns so our Step Up Triangles Stencil from our Modern Stencils Collection completely fit her wedding theme! With over 600 designer stencils, you are sure to find a stencil to fit your event’s style as well! Our little wedding favor for YOU is the complete tutorial on creating this super easy DIY Photo Booth Backdrop. 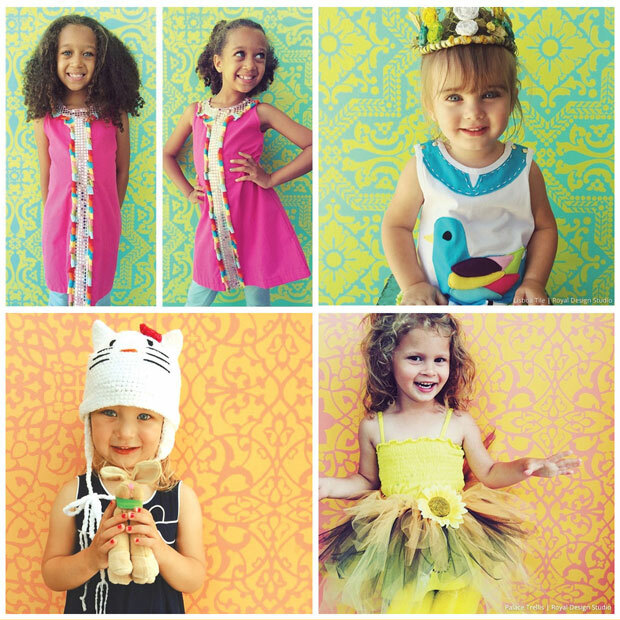 Zoology Kids used our Lisboa Tile Stencil and Palace Trellis Moroccan Stencil in fun bright colors to showcase their “newly born, wildly happy kids’ line with a soft spot for animals.” Like their darling clothing and accessories, our stencils inspire creativity, curiosity, and joy. 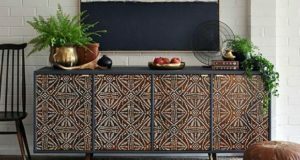 For your photo shoots , we recommend to design a couple of your own backdrops using colors that excite you and stencil patterns that express your individuality. This allows you the ability to switch up your background to accommodate different looks! Don’t think this means double work. Each backdrop can be done easily with a roller in less than an hour! 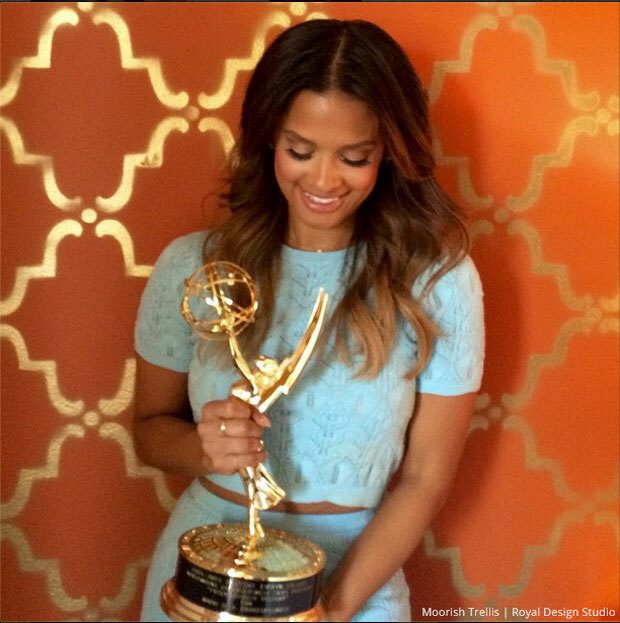 The talented Rosci Diaz is officially an Emmy winner! She is a powerhouse TV host, with BET Networks, 106 and Park, and Entertainment Tonight under her belt. We are absolutely tickled pink that our Moorish Trellis Wall Stencil from our Moroccan Stencils Collection made it into her Emmy announcement on Instagram! The beautiful combination of burnt orange and metallic gold is so upscale and elegant – just like Ms. Diaz and Mr. Emmy! 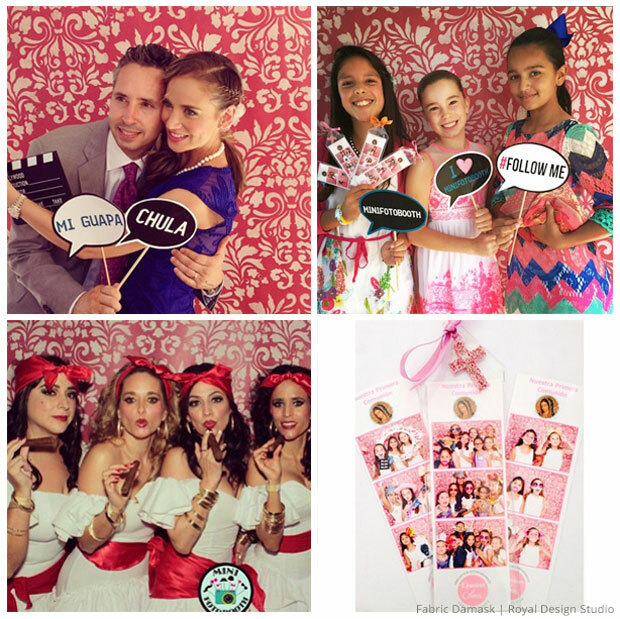 Mini Foto Booth, a photo booth rental company based in Mexico, knows that the best moments are here and now, and can only be captured instantly. Backdrops believe it or not play an important role because it provides a cohesiveness to your pictures! You can easily tell all the pictures came from the same event based on the backdrop! This helps attendees to commemorate and reminisce the precious yet fleeting moments of birthdays, weddings, reunions, and more! The party goers shown above chose our Fabric Damask Wall Stencil for their event. But you can use any of our stencil patterns to remember how fun that party was and how happy you and your friends were! See how easy it is to create memorable photos that all coordinate with one another and the event? Who wouldn’t want an epic Star Wars themed birthday party? Since most of us don’t have millions to spend on an entire movie set production, the DIY route is the way to go! 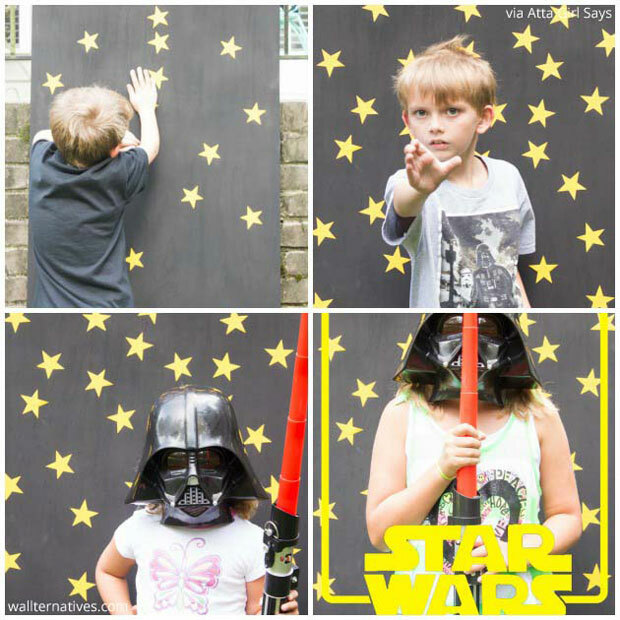 Amy of Atta Girl Says teamed up with her son to create a cool Star Wars photo booth backdrop with Wallternatives wall decals. 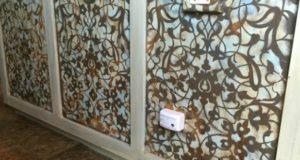 These peel and stick wall stickers are even easier to use than stencils! After painting a scrap of plywood with carbon black paint, they randomly stuck our yellow Stars Vinyl Pattern Pack Minis on it. To add even more movie magic to their photos, she added image overlays to create a custom movie poster. That’s one lucky Jedi! 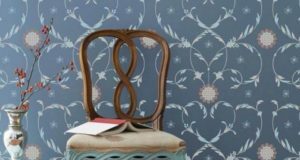 Wonder whether stencils or decals are for you? Remember although decals are definitely the faster option, you have less colors to choose from. 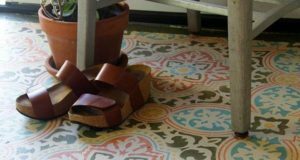 With stencils, you will spend a little bit longer painting and waiting for it to dry, but you have every color to choose from! Well, we hope you’ve enjoyed these DIY stenciled backdrops inspire you to create your own custom party decor! We’d love to see and feature YOUR stencil ideas too, so be sure to send them in! Email your pictures at projects@royaldesignstudio.com or share them with us on our Facebook page. You can even Instagram your pics and tag them with @royaldesignstudio and #royaldesignstudio.